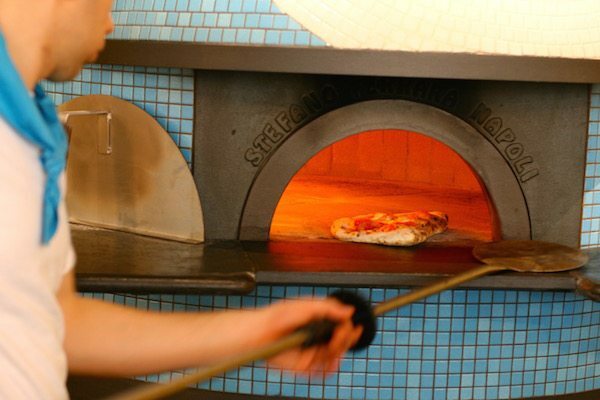 Dinner this evening comes courtesy of Nuposto, the Neapolitan pizzeria based in the heart of the city centre on West St, serving authentic antipasti and pizza, not to mention insalate, coffees and puddings. Do I need to reserve a table? Think about which bus to catch into town? See what the weather is like should I decide to walk? The answer to each of these questions is a resounding no because I’m ordering online with food delivery specialists Deliveroo. 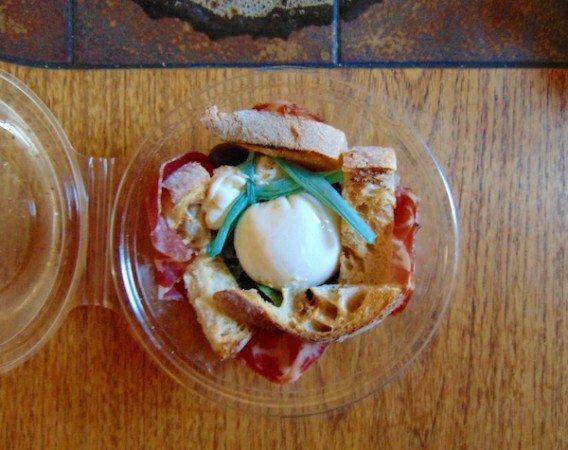 They’ve teamed up with a host of top Brighton restaurants, meaning lucky Brightonians are now able to enjoy restaurant quality food in the comfort of their own home. 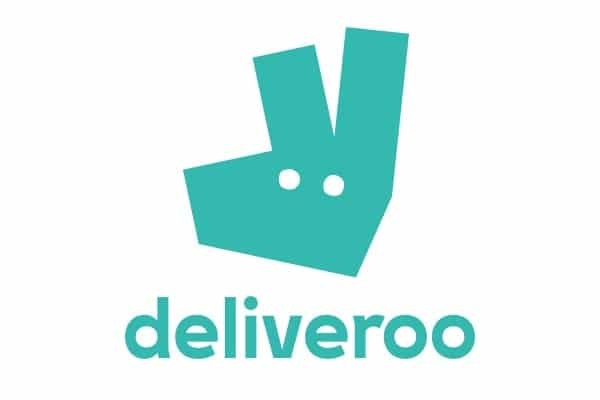 Entering your postcode on the Deliveroo home page determines which restaurants are available to order from, there’s always a diverse selection. Specify the time you’d like to receive the food – a neat touch – then place your order, click to checkout and job done. All you have to do next is put your feet up and wait for the food to arrive. Time is pressing on this evening, my friend and I are famished and so we opt for an ASAP delivery. Deliveroo calculates our order will be with us in a very reasonable 35 minutes yet somewhat miraculously the food arrives in a super quick 25 minutes. Packaging wise, as well as appearing recyclable, everything’s properly housed, intact and warm. Nuposto’s menu offers in the region of eight traditional antipasti dishes. Bruschetta, marinated olives and Tagliere Di Antipasti – a platter of cured Italian meats with buffalo mozzarella all feature as examples and where would we be without some garlic bread? 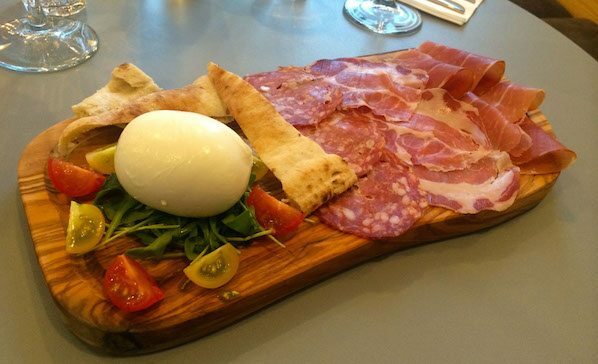 Included here, with or without mozzarella; we’ve ordered the latter along with Burrata Pugliese – mozzarella with Capocollo, an Italian salume. 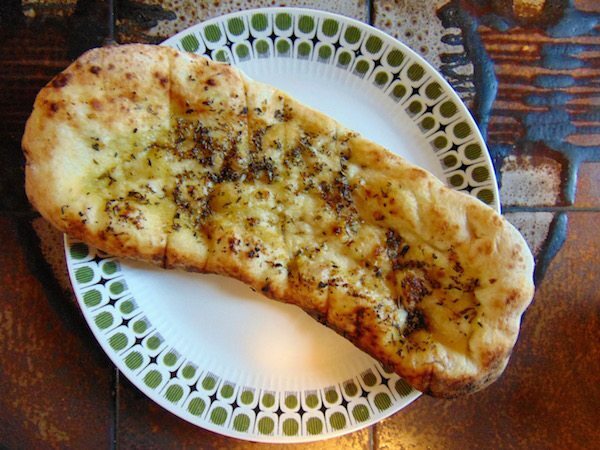 The garlic bread is generous, pleasantly rustic and sprinkled with aromatic herbs. The garlic is prominent without over powering; the bread is crisp and toasty. It’s a resolute offering and certainly a cut above the norm. Immediately apparent is the quality of the mozzarella that’s been used for the Burrata Pugliese, exhibiting a rich creamy consistency coupled with a subtle sourness. The Capocollo, cured pork shoulder, has an opulent briny flavour. Accompanying cherry toms are ripe and juicy while black olives also pack a punch. The whole combination is a treat and a great intro to Nupusto’s cuisine. 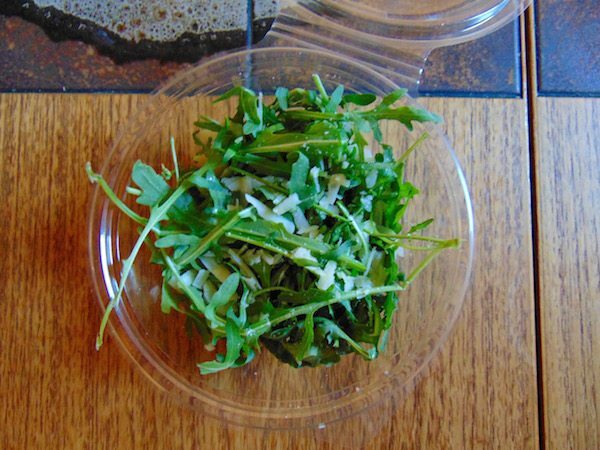 To accompany our pizzas we have a rocket and Parmesan salad lightly dressed with olive oil and balsamic. It’s peppery fresh and the cheese is of good quality, housing an up front nutty tang. Of the pizzas, there are plenty to ponder, both traditional and some more contemporary. 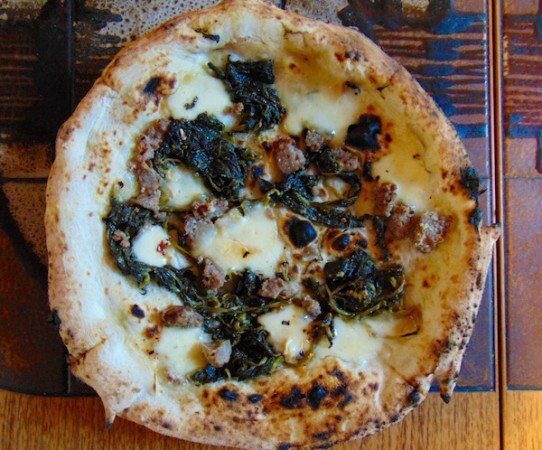 We’ve ordered the timeless classic that is a Napoli, with a gluten free base and an Amalfi on traditional dough. Reassuringly, the Napoli’s gluten-free base (in comparison to the Amalfi) is notably different, slightly thinner and a touch softer but nonetheless tasty. All the classic components are presented here and working to good ends. 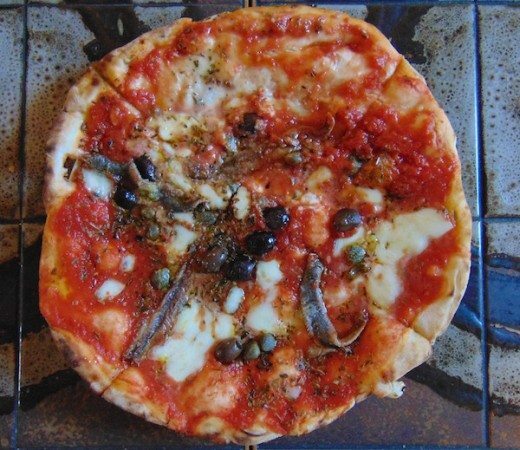 Pungent anchovies, piquant capers and those hearty black olives again rest on a rich tomato base laced with garlic and fragrant oregano. A classic no doubt. The flavours of the Amalfi are more rounded, the ingredients a touch more fulsome. Nestled amongst delicately smoked mozzarella lie pieces of earthy Friarielli (a type of broccoli) and an Italian sausage exhibiting a lively streak of fennel. The base is crisp, floury and lightly singed here and there from the oven. 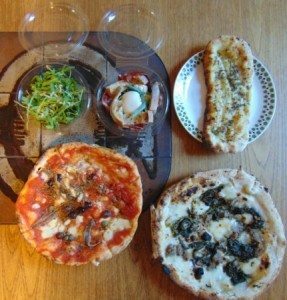 It’s a supremely tasty pizza; our pick of a fine meal and not a morsel is left over. If takeaway pizzas usually conjure up images of indiscriminate melted cheese, questionable slithers of pepperoni and ill-fated ‘bbq’ chicken then it’s time to think again. Nuposto’s authentic ingredients and flavours put paid to those notions, realigning the senses as you eat. Visit the Restaurants Brighton takeaway and home delivery guide.